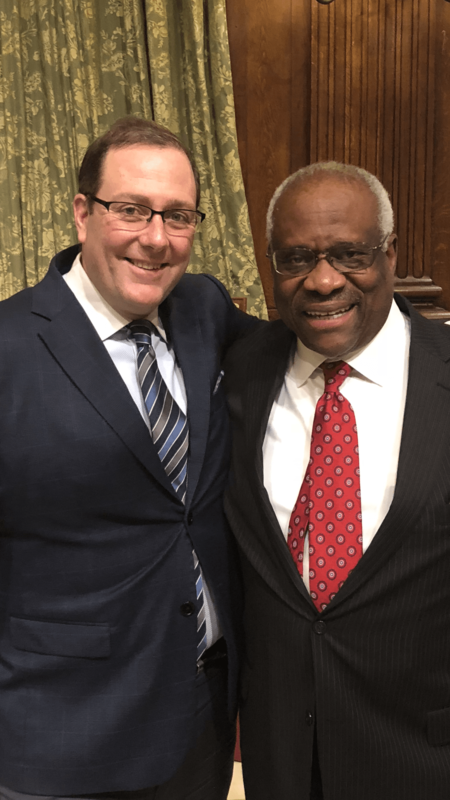 John O. McManus, Founding Principal of McManus & Associates, was featured as one of New York’s Leading Lawyers in a special section of award-winning New York Magazine. Here’s a picture of the plaque celebrating the special recognition. 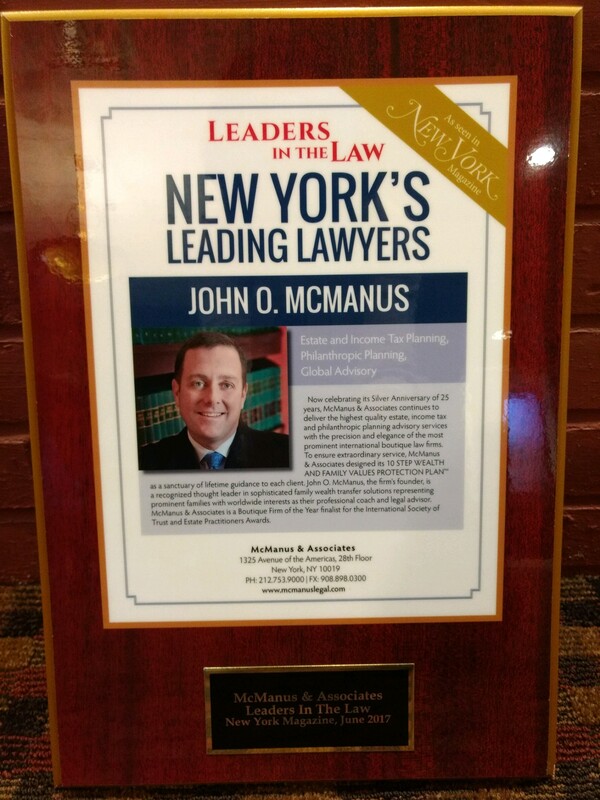 McManus & Associates congratulates you, John, for being chosen as a “Leader in the Law”! McManus & Associates, a top-rated estate planning law firm celebrating 25 years of success, today announced that it has been named a Boutique Firm of the Year Finalist by the international Society of Trust and Estate Practitioners (STEP) for the organization’s 2017/18 Private Client Awards. STEP is a prestigious, invitation-only worldwide organization of estate planners who advise international families on their global interests. Fun way to end the week: the entry page for SmartCEO’s New York CPA & ESQ awards is emblazoned with a quote from McManus & Associates Founding Principal John O. McManus. NEW YORK, NY – July 24, 2013 – McManus & Associates is the only American law firm that has been named a finalist for the Society of Trust and Estate Practitioners (STEP) Private Client Awards 2013/2014 in the “Boutique Firm of the Year” category, the firm announced today. STEP is an invitation-only professional association for worldwide leading practitioners dealing with family inheritance and succession planning. It has 18,500 members across 80 jurisdictions from a broad range of professional backgrounds. Demonstrate excellence over the past year, taking into account significant obstacles that have been overcome. Demonstrate consistent quality of work over the past year. Demonstrate excellent client service building on-going relationships aligned with the interests of clients in a transparent and cost effective manner, and where appropriate, bespoke. Demonstrate excellence in leadership, including a clear vision for the future. Demonstrate excellence in technical skills and a qualified team with support for on-going continual professional development and education. Where applicable, demonstrate innovation and involvement in interesting, challenging or new areas of practice. Demonstrate conflict management by differentiating itself from its competitors and exploiting opportunities. Demonstrate a broader contribution to the profession – contribution to wider social responsibility, including support for good causes and maintaining high standards of staff treatment. Demonstrate staff retention and explanation for its achievement and maintenance. The Awards judges have assessed entries and shortlisted up to five finalists worldwide. The Awards ceremony will take place on September 18, 2013 in London. The advisors are highlighted in a special editorial section within the July/August 2013 issue of The New York Enterprise Report magazine, as well as on nyreport.com. The top accountants and attorneys were announced at a networking reception on June 19, 2013 at the Citi Executive Conference Center. To see additional awards that McManus & Associates has been grateful to receive, visit the firm’s Honors & Recognitions page: https://mcmanuslegal.com/about-us/honors-and-recognitions/. McManus & Associates, a trusts and estates law firm, was formed in 1991 by John O. McManus to provide the highest quality experience of the largest firms coupled with the intimacy and efficiency of a specialized boutique firm. Over 20 years later, McManus & Associates continues to earn its reputation for integrity, intellectual ability, efficiency, and enduring relationships through its signature 10-Step Wealth and Family Values Protection Process™. We’re excited to share that McManus & Associates has been named a finalist in the category “Boutique Firm of the Year” (sponsored by Citibank N.A.) for the STEP Private Client Awards 2013/2014. STEP, the Society of Trust and Estate Practitioners, is the leading worldwide professional association for practitioners dealing with family inheritance and succession planning. The STEP Private Client Awards highlight excellence among private client solicitors/attorneys, accountants, barristers, bankers, trust managers and financial advisors. So far, the Awards judges have assessed entries and shortlisted up to five nominees per category. To see the full list of categories and finalists, click here. The Awards ceremony will take place on September, 18 2013 in London. Wish us luck!